Spiders are amongst the most feared arthropods around. The fear of spider bites is real. The combination of their leggy appearance, their unpredictability and a neverending negative cultural connotation is what makes our hearts beat faster when encountering one. If we believe our own thoughts, spiders are out to kill and destroy humanity, which is complete nonsense, of course (read more about fear of spiders here). Way too often we blame the spider for causing minor skin irritation. Truth is, however, that spider bites are rather uncommon and the vast majority are completely harmless. Many spiders can’t even break through human skin, and if they can, they’ll only bite when severely threatened. Only a very few spider bites are potentially dangerous and should raise concern. In case you get bitten by one of the few potential dangerous species, don’t panic and remember we’re not on the menu. Our perceptions of the consequences are culturally based and in most cases strongly exaggerated. However, take the bite serious and try to catch the spider safely, or take a picture, instead of furiously killing it. Spider identification will answer your question on the best way to treat a bite and whether to seek medical help. Spiders from the family of Theraphosidae are often referred to as bird spiders or bird eaters but are most commonly known as tarantulas. In general, they’re rather hairy and big, but as always exceptions make the rule (read more about theraphosid spp. here). 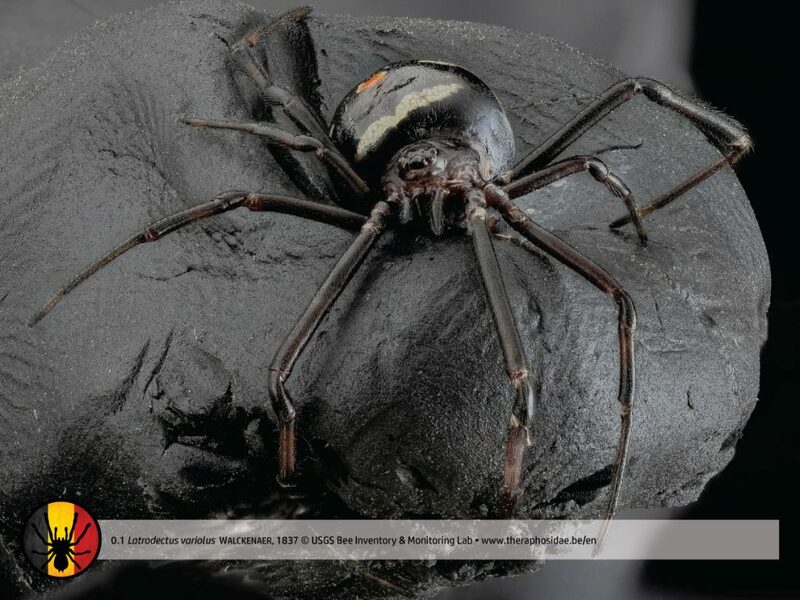 Not one spider of the Theraphosid family is considered to be life-threatening, but with chelicerae up to 15mm in bigger species, the physical bite can be highly unpleasant. The injury itself will hurt for a while and surrounding tissue may respond in uncomfortable itching and/or painful ways.  In case of envenomation quite a few bites of theraphosid spiders, mainly African and Asian species, can cause severe pain for a couple of hours or longer. All this depends on the spider itself, the spider’s condition and the amount of venom released. The victim’s condition may be even more serious if the victim reacts with a hypersensitivity. How do spiders behave before the actual bite? All spiders care about is shelter, food and reproduction. Survival, actually, that’s what their life is about. They live solitary (in most cases) and like dark places, far away from humans and other animals, in order to avoid any disturbance. If any prey walks by a hungry spider it probably won’t survive the encounter. In some cases, the spider might meet its match and die in a battle with a larger or luckier opponent. Spiders are no match for humans. We can kill them easily which is why they avoid encounters with humans. Spiders will almost always try to escape. 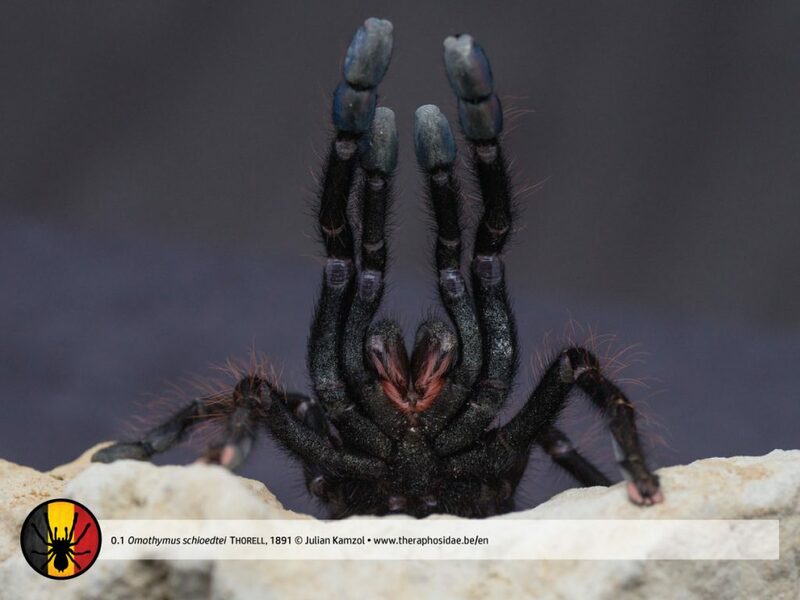 If the spider is concerned and escape is not possible then further discturbance may result in use of urticating setae (in some New World theraphosid species) a threat pose and/or a bite. Some spiders stridulate while fleeing or in threat pose. With their front legs up they show their chelicerae to impress the intruder. In some cases, you might notice a drop of venom on the fangs. It is clear that if you disturb any further the spider won’t hesitate to bite. Don’t ignore any of these warning signs! • The spider will try to flee. If not given the opportunity the spider might threat pose or bite immediately. Sometimes we’re unaware of such situations. Take precautions and stay alert. • After fleeing, some American theraphosid species may use urticating setae. This may result in an itching sensation. • When there’s no other option left the spider will show a threat pose. The spider will raise its front legs and show its fangs. In some cases, you’ll notice a drop of venom. • If you hear the spider making noise, it’s stridulating. The spider will do everything in its power to express the danger. • Any further disturbance will result in a bite. How can I prevent a spider bite? • Respect the spider as predominantly solitary creatures. • Don’t handle spiders in any way. An extra warning goes out to those who are not (or those who only think they are) familiar with spider behavior. There’s nothing to prove. • Don’t reach into dark places with unprotected body parts. • Clean and organize your personal living space on a regular basis. • Don’t walk in short thin clothes in area where (medically significant) spiders are active, esp. at night. Cover the entire body instead. On a side note, in these circumstances it’s best to use thick shoes and protect everything underneath the knees with impenetrable material to avoid snake bites as well. • Investigate before you travel. Know which species to look out for, how they live and what they look like. • Inspect your clothes thoroughly before wearing them, esp. in areas you know medically significant species are active. No reason to be paranoid though. • Never leave your kids without supervision close to spiders. This advice is especially valid in areas known to shelter medically significant spiders. Some people tend to keep arachnids in their houses. They do so out of passion for the animal. They are not looking for any disturbance with their neighbors nor will they release their spiders on purpose. On the contrary. Hobbyists spend a lot of time taking care of their pets, making sure they live a good life in perfect conditions. In fact, arachnid pet keepers do exactly the same for their pets like others would for their cats or dogs. In the meantime, they’re doing everything they can to fight misconceptions regarding arachnids. Few hobbyist keepers give lectures at schools and build websites but nearly all of them will welcome anyone at their houses to show the spiders and give proper information. After all, spiders, and often the keepers themselves, are by far one of the most misunderstood creatures around. This section is especially for those passionate keepers to prevent spiders from successful escape which may result in a bite. As they work with spiders daily, prevention is better than a cure. The spider has been in uncomfortable situations for quite a while since its departure. It might be stressed and react in ways you won’t expect. Make sure everything is prepared before you open the lid. Unpack in an open surface area like a big uncluttered table. An escaping spider will probably hide itself in the first dark spot it encounters. In some cases, it might be very difficult to get the spider out. Freedom of movement is crucial when you’re working with spiders. Some hobbyists prepare themselves by adding a few loose towels or boxes on their sides around the working place in the hope the escaping spider will hide in them. It’s highly recommended to keep a transparent catchbox around twice the spider’s size nearby. In case of escape, just put the box quietly over the escaping spider and start all over again. Make sure you have your long tweezers nearby and the spider’s new home is ready before unboxing. Now, if possible, check where the spider is at and how it’s behaving. If it’s acting nervously and/or showing a threat pose, you should wait until it cools down. Smaller species are often wrapped in kitchen paper or firmly secured underneath. Bigger species come in bigger boxes packed with enough paper as well. Sellers do this to minimize the risk of accidents during transport. The “uncomfortable situations” I was talking about earlier in this section is from movement caused by transport and not the fact they are being properly secured. Put the box in the new enclosure and keep a safe distance. Remove the lid with long tweezers before you cautiously pull the paper out. If done properly the spider will come out in small, controlled movements, but yet again, the exceptions make the rule. Once the spider gets out, remove the box and paper with your tweezers and safely close the enclosure. If you’re not feeling comfortable, just put the box in the enclosure, remove the lid, create a little opening for the spider to walk out, safely close the enclosure and wait. Once you’ve noticed the spider is out, calm and in its hide, carefully remove the box with your tweezers. Sometimes, mainly with terraria with front openings, it’s easier to let the spider leave its transport box in another bigger box. Catch the spider as mentioned in “rehousing a spider” and release it as described above. In rare cases, the spider runs upwards along the tweezers. To prevent this you might want to grease the tweezers. This way the spider can’t get a grip on it. Same sized enclosure: Make sure everything is prepared (open surface area, transparent catchbox, (greased) tweezers, new enclosure). Read more about that underneath “unboxing a spider after delivery”. To rehouse a spider, the rehouse itself must be necessary in the first place. If you doubt its necessity, leave the spider. The lesser the disturbance, the better. Never rehouse a spider by luring it onto your hands. This is disaster waiting to happen. Keep a safe distance by using (greased) tweezers, a catchbox and/or a plastic bottle without the large end opposite the drinking end (with the cap on). Don’t poke the spider, but try to lure it out of the hide instead. If unsuccessful you might like to remove its hide and catch the spider with either the bottle or the catchbox. Easier is to catch the spider when it’s calmly resting against the glass. In case you use a catchbox (like a cricket box or a clear food storage cup), put the box over the spider and shove the lid calmly underneath the spider. It will walk inside the box and you can easily close the lid. In case you use the plastic bottle without bottom (video by Poeci1), put the bottle over the spider and it will run inside. Make sure the top opening is closed. Place the box or the bottle inside the spider’s new terrarium and wait until it got out by itself. If you don’t have that patience, you might try to tilt the box inside its new enclosure. The spider maybe walks out. Don’t poke the spider or blow from the top of the bottle. Bigger enclosure: Try to put the previous enclosure inside the new one. If not, try the same as mentioned above. This isn’t too difficult. Spiders love food. In fact, they have an advanced anatomy and web-system to inform themselves about prey nearby. Open the terrarium if the spider isn’t too close to a possible escape. Get the cricket box, lift one corner of the lid and let the preferred amount of crickets fall inside the spider’s terrarium. This only works in terraria with top openings. In other cases catch the preferred amount of crickets, I use little film roll vials to do so, open the terrarium and add them in the enclosure by just tilting the vial. With any prey you use, keep a safe distance. Never mess around in the enclosure with your bare hands. Close the terrarium immediately after feeding. Out of all spider bites, it is known that adult males bite more often. As you’re about to remove the adult male from his enclosure in order to present him to his lady, be very cautious. You may use the same techniques as described underneath “rehousing a spider”. Way safer with smaller enclosures is to put both terraria in a bigger box, remove the lids of both enclosures and leave the spiders’ enclosures next to each other. The male will start to wander, especially at night, in his search for a receptive lady. Make sure you close the bigger box once you’re planning to leave. If you’re planning to save the male from being eaten, use long greased tweezers and have a transparent catchbox twice the size of the male nearby. Breeding details are different to each species for which reason we recommend you to take a look in our detailed care-sheets. Almost everything can be done with long tweezers. Brushes with long handles can serve as well. Use warm water and kitchen paper. Feces will need a little more effort, but a flat razor on glass surfaces will help significantly. The more experienced you become, the more you’ll understand there are a certain moments in which you can freely clean the windows, without removing the spider or using advanced techniques. Please be advised this is not the case with all spiders. We always recommend to keep a safe distance. Never use detergent! Only if necessary you might have to take out the spider using the techniques as described underneath “rehousing a spider”. • Organize yourself before working with the spiders; choose an open surface area & get all your materials ready (incl. long tweezers and a transparent catchbox). • Keep a safe distance, always, whenever you’re working with spiders. Don’t handle. • Observe your spiders and learn about their behavior. Individuals within the same species can also exhibit different behaviors. Do not assume all specimens from 1 species type will behave the same. By understanding a spider’s behavior potential escapes and bites are firmly reduced. • Never leave your kids without supervision in your spider room. • Respect the spider as predominantly solitary creatures and minimize your disturbances to an absolute necessary minimum. I have been bitten, what do I do now? • Clean the injury with tepid (running) water. • Disinfect the wound (alcohol, iso-betadine or chlorhexidine). • Especially in cases you’re showing signs of infection (redness, heat, pain) or more severe reaction, please contact your doctor. Give the doctor more information about the person’s age, weight and condition, time and location of the bite & type of spider (if possible). • Place ice (wrapped in cloth) or cold wet cloth on and around the bite site. Which spiders are potentially dangerous to humans? Before I go any further I’d like to point out this list is never complete. Take every bite serious and go to a doctor as soon as possible! Nonetheless, up to date, quite a few spiders are notorious to carry a venom which can be very effective in humans. Some spiders’ venom is considered to be less effective, but induces more severe reactions than others. I’m not making any statements about venom potency. This is a scientific matter, but due to its complexity it isn’t very clear for science either (read more on our page about anatomy). Click any link below to learn more about a certain family, genus and/or species. • Lycosidae (wolf spiders): Painful. Treat like any spider bite. Seek medical assistance. • Cheiracanthium spp. (family Eutichuridae): Yellow sac spider: Painful. Treat like any spider bite. Seek medical assistance. Plenty of rumours go around about Cheiracanthium spp.. Some of the genus might cause necrotic arachnadism. Up to date we haven’t found any scientific evidence. Please inform us if you do. • Trachelas spp. (family Corinnidae): Reddish sac spider: Painful. Treat like any spider bite. Seek medical assistance. Plenty of rumours go around about Trachelas spp.. Some of the genus might cause necrotic arachnadism. Up to date we haven’t found any scientific evidence. Please inform us if you do. • Asian and African theraphosid spp., such as Poecilotheria spp., Pterinochilus spp., Pelinobius spp. : Very painful. Treat like any spider bite. Seek medical assistance. • Eratigena agrestis (family Agelenidae): Most bites attributed to the notorious Loxosceles spp. are in reality Eratigena bites (source). Painful. Treat like any spider bite. Seek medical assistance. • Latrodectus spp. (family Theridiidae): Very painful & clinically significant. Causes latrodectism, which includes all symptoms caused by a Latrodectus spider. Seek medical assistance. Read more in this link. Clinical Toxinology resources (CTR). • Atrax spp. (family Atracidae): Very painful & clinically significant. Atrax spp. often strike more than once while releasing as much venom as possible. CTR. Hadronyche spp. and Illawarra wisharti Gray, 2010 are related to Atrax spp. but lack atraxotoxin. Symptoms, however, can be similar to an bite from Atrax spp. Seek medical assistance. CTR. • Loxosceles spp. (family Sicariidae): Very painful & clinically significant, necrotic arachnidism. Different to all other spider bites you need to keep the area dry! Seek medical assistance. CTR. • Phoneutria spp. (family Ctenidae): Potentially dangerous, with venom considered to be more potent than Atrax spp. and Latrodectus spp. The spider, however, only releases venom in 33% of cases, of which only 2,3% needed antivenom (source). You’ll experience local pain and swelling. Seek medical assistance. CTR. Special thanks goes out to Griet Bellekens from Educ-Aid Training & Consulting for the provided information. Big thanks to Rik Ieven, Miloš Anić, Josh Bradley and Julian Kamzol for their help as well.